Most time there’s little time, sometime there’s NO TIME! 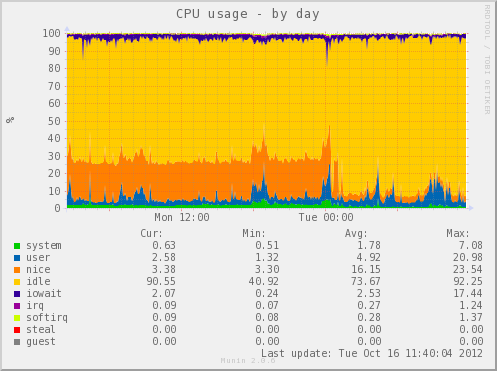 A few days ago I had no time, and had to manipulate a badly exported database (2million+ single myisam insert statements) tuning mysqld was useless, insert delayed useless, increasing buffers useless… and so on… import was taking hours (many hours) on the target box due to impressively high disk io! So I just fired up a vmware instance with 32gb of ram, 10gb hdd and 8cpu cores (of a xeon L56xx) and did everything in ram. PS: I do the same (storage on ramdisk) when I’ve to compile a linux kernel. specifically this one downloads all the “.dem” (-A .dem) (team fortress demo files) located into the remote “/tf2/orangebox/tf/” directory. Additionally it makes use of timestamping (-N) in order to not download already existing files when doing a subsequent run.